More than 60 schools have been closed across Wales and vehicles are stuck on a road following snow. Gwynedd has more than 30 schools shut, while snow has also closed dozens of schools across Pembrokeshire, Carmarthenshire and Anglesey. A number of vehicles also became stuck on the A4075 in Pembrokeshire between the A40 Canaston Bridge Roundabout and the B4586 near Yerbeston. Gritters were sent to the road. The Met Office said temperatures overnight in England and Wales were the coldest on record this year. 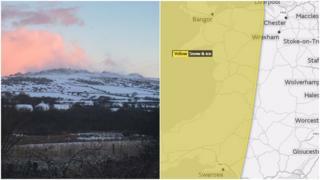 A Met Office 'be aware' yellow weather warning was in place for much of Wales for snow and ice until 10:00 GMT Wednesday and overnight temperatures in Sennybridge, Powys plummeted to -7.6C (18.3F). Motorists were urged to take care on untreated roads. Met Office meteorologist Martin Bowles said by Wednesday morning, snow flurries "would ease off" and most of the UK would have a "dry, sunny but cold day." "For much of the country, a big chunk of England and Wales and southern Scotland is going to be dry and colder, with temperatures below average still," he added. Image caption Motorists have been asked to take care on untreated roads. National Trust Wales also announced the closure of Penrhyn Castle near Bangor.